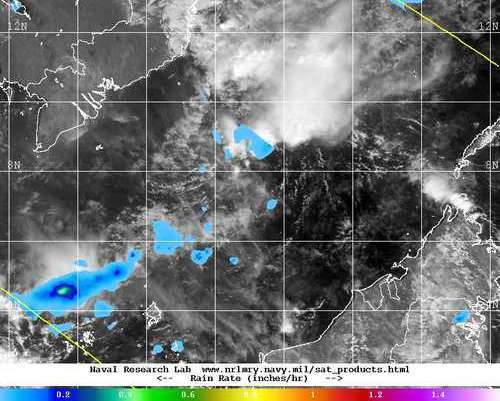 NASA's TRMM satellite captured rainfall data on Tropical Depression Wukong as it struggles to stay together in the South China Sea. Wukong has been battered with wind shear for days and NASA satellite data still shows an area of moderate rainfall within the dying storm. NASA's Tropical Rainfall Measuring Mission or TRMM satellite passed over Tropical Depression Wukong on Dec. 28 at 0328 UTC (10:28 p.m. EST, Dec. 27) and saw one area of moderate rainfall near the center of circulation. That area was generating a rainfall rate of about 1 inch/25 mm per hour. Most of the other precipitation in the storm is lighter and scattered. On Dec. 28 at 0900 UTC (4 a.m. EST) Tropical Depression Wukong had maximum sustained winds near 25 knots (28.7 mph/46.3 kph). Satellite data helped pinpoint Wukong's center near 8.7 north latitude and 111.0 east longitude, about 280 miles (322 miles/518.6 km) east of Ho Chi Minh, Vietnam. Wukong continues to move to the west-southwest staying south of Vietnam. Wukong is moving around the southern edge of a ridge (elongated) area of high pressure and being battered with moderate southeasterly vertical wind shear. According to the forecasters at the Joint Typhoon Warning Center (JTWC), the wind shear has exposed the low level circulation center. JTWC forecasters expect the depression to continue moving west-southwest over the next day or two before finally dissipating.